Can sipping aloe juice help you lose weight? his summer, people aren’t just slathering aloe vera on their sun-scorched skin. They're chugging it in hopes of losing weight, too. Aloe juice or aloe water—which can be found at health food stores—isn't as goopy or neon green as the stuff from the drugstore, but it’s marketed as being equally magical. And while juicing aloe is a relatively new concept in the U.S., people in Latin America and the Arabian Peninsula have been using the stuff to relieve symptoms of diabetes, including high blood sugar, for a long time, according to a review published in Herbal Medicine: Biomolecular and Clinical Aspects. Inside every green aloe vera succulent, you’ll find about 75 potentially active compounds including antioxidants (vitamins A, C, and E), enzymes, minerals, sugars, fiber, and amino acids, according to the Indian Journal of Dermatology. Some research even suggests that the goo has anti-inflammatory benefits, according to the Herbal Medicinereview. And since inflammation is linked to weight gain and metabolic problems, it makes sense why some people would think this leads to weight loss. However, if you look at the nutrition label on the back of an aloe juice bottle, you probably won’t find much of anything, said NYC-based dietitian Albert Matheny, R.D., C.S.C.S. For instance, many brands contain only carbohydrates and sodium. Often, the nutrition labels lists zero calcium, iron, protein, fat, or vitamins A and C. Some contain more vitamins, either from the aloe itself or other ingredients like lemon juice and honey. Plus, an eight-ounce serving of some brands contains up to 15 grams of sugar—and no fiber. “It’s basically just sugar water,” Matheny said. However, he notes that thicker, gloppier aloe juice varieties generally contain more actual aloe and nutrients than the thinner, tastier ones. So how did glorified sugar water get a rep for weight loss? As it turns out, lots of common aloe juices contain aloin, a potent natural laxative. That might explain why many people who drink aloe juice swear that it's helped them lose weight, Matheny said. 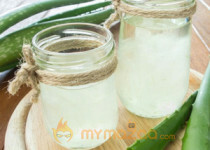 “The aloe is probably not speeding up their metabolism or resulting in any real weight loss," he said. "Laxatives, like aloin, don't result in fat loss, just loss of water weight through going to the bathroom." What’s more, aloin has been linked to abdominal cramps, diarrhea, red urine, hepatitis, electrolyte imbalances, and rebound constipation. Lovely. OK, so it's probably not the magic weight-loss drink you'd hoped for. But does it have other health-boosting benefits? That depends on the nutrients in the exact bottle you’re buying (Matheny recommends looking for lots of fiber, vitamins, and other minerals on your nutrition label). But, it’s important to outline out a few times you should never drink aloe. According to a review published in the Indian Journal of Dermatology, women should never consume aloe while pregnant or breastfeeding. Theoretically, aloe can spur uterine contractions and, in breastfeeding mothers, could cause GI issues in infants. Plus, some people are actually allergic to aloe! If you've experienced skin irritation after applying aloe gel to sunburns or have a known allergy to aloe’s cousins, onion and garlic, don’t sip aloe juice. Unless you absolutely loooooove the taste of green goo, you're better of sipping these drinks that are more effective for weight loss.